For this book, if I had to chose one word to describe it that word would be 'painstaking'. The book has been deeply researched by the author to give us all of the pertinent and newest information about this campaign. It has plenty of maps and some handy charts so that the reader can follow along with ease. The author's findings are eye-opening at times, from the morale of the 7th Armored Division, and the fact that the Allies lost so many tanks that the replacement rate could not keep up. While the book at times does take aim at Montgomery, it does state that his constant offensives kept the Germans off balance and unable to stage any large attacks of their own. On page eighty-two there is a chart comparing the six most used tanks in the Normandy campaign, although it does not list the actual versions. The chart, to say the least, is interesting. It shows the different tanks' road and cross country speeds. The odd thing is that it lists the Tiger as being one mile per hour faster than the Sherman in both cases. While this is contrary to many other written reports, it might well be true. I have seen countless videos of refurbished World War II tanks and I am always impressed by the Tiger. Its turning ability, acceleration, and speed seem to be better than most of the other tanks that are shown at Bovington, etc. So the numbers listed in this book could be correct. 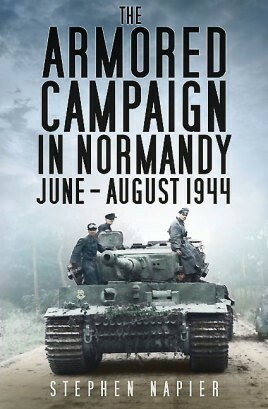 As any history of the Normandy campaign would, this book has a part on the attack of Michael Wittmann at Villers Bocage. The author not only shows Wittmann's real tally, he also shows that his charge into the town was not a very smart move. The author continues with the tale of the equally foolish and unsuccessful German panzer attack later. The book is just as good when dealing with the sweeping large picture, or coming down to the day to day details of each operation. This is somewhat rare in a book like this. Usually an author is able to either do one well, but not the other. This is not the case here. The small details that the author shows us are in a lot of cases only found in this book. For instance, the author tells a story about a German officer of some 88mm anti-aircraft guns being forced at gunpoint by a fellow German to help stop a British advance with his guns in the anti-tank role. The author also goes into the 'tank scandal' issue. The 'tank scandal' was played out in the British Parliament. The issue started because of British tankers writing home about what they perceived as their own tanks being inferior to the German ones. This issue was debated heavily in Parliament for a good bit of time. The book is 400+ pages long. It takes the reader from the invasion on D-Day to the end of the fighting at the Falaise Gap. I highly recommend this book as the best and most encyclopedic tome on armored warfare in Normandy. I am trying to get in contact with Stephen can anyone help with an email or telephone?